General Description of GnRH-Receptor / LH-RH Receptor. Recognizes an epitope on the extracellular domain of gonadotropin releasing hormone (GnRH) receptor or luteinizing hormone receptor (LHCGR). Lutropin (also designated luteinizing hormone) plays a role in spermatogenesis, ovulation by stimulating the testes, ovaries to produce steroids. Gonadotropin (also designated choriogonadotropin) production in the placenta maintains estrogen, progesterone levels during the first trimester of pregnancy. Ovaries, testes abundantly express luteinizing hormone/choriogonadotropin receptor. GnRH receptor contains seven hydrophobic transmembrane domains connected by hydrophilic extracellular, intracellular loops characteristic of G-protein coupled receptors. GnRH stimulates the gonadotrophs of the anterior pituitary to secrete luteinizing hormone (LH) as well as follicle-stimulating hormone (FSH). GnRH influences the protective effect of pregnancy, Gonadotropin against breast cancer. 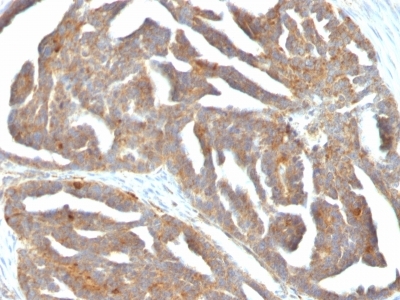 The expression of GnRH on breast carcinoma correlates in part to the degree of tumor differentiation. GnRH-positive breast tumors occur more frequently in tumors with greater cell differentiation in premenopausal women. GnRH is present in luteal, granulosa cells as well as in ovarian cell membrane preparations. Anti-Human and Rat GnRH-Receptor / LH-RH Receptor Positive Control Sample: T47D cells. Pituitary gland, ovarian or breast cancers. Immunogen: A synthetic peptide aa 1-29 (MANSASPEQNQHCSAINNSIPLMQGNLPY) from the N-terminal of human GnRH receptor. enQuire Bio's GnRH-Receptor / LH-RH Receptor Anti-Human Monoclonal is available for Research Use Only. This antibody is guaranteed to work for a period of two years when properly stored.